"Xone" and "XBO" redirect here. For the fantasy novel, see Xone of Contention. For the airport, see Boulsa Airport. For other uses, see XB1. Moving away from its predecessor's PowerPC-based architecture, Xbox One marks a shift back to the x86 architecture used in the original Xbox; it features an AMD Accelerated Processing Unit (APU) built around the x86-64 instruction set. Xbox One's controller was redesigned over the Xbox 360's, with a redesigned body, D-pad, and triggers capable of delivering directional haptic feedback. The console places an increased emphasis on cloud computing, as well as social networking features, and the ability to record and share video clips or screenshots from gameplay, or live-stream directly to streaming services such as Mixer and Twitch. Games can also be played off-console via a local area network on supported Windows 10 devices. The console can play Blu-ray Disc, and overlay live television programming from an existing set-top box or a digital tuner for digital terrestrial television with an enhanced program guide. The console optionally included a redesigned Kinect sensor, marketed as the "Kinect 2.0", providing improved motion tracking and voice recognition. Xbox One is the successor to Xbox 360, Microsoft's previous video game console, which was introduced in 2005 as part of the seventh generation of video game consoles. Over the years, the 360 had received a number of small hardware revisions to reduce the unit's size and improve its reliability. In 2010, Microsoft's Chris Lewis stated that the 360 was about "halfway" through its lifecycle; this was aided by the introduction of the Kinect motion sensor that year, which Lewis stated would extend the lifecycle by five years. Initial hardware for the 360's successor, commonly referred to by the industry as the "Xbox 720", was reportedly under development as early as May 2011. The official developer kit was codenamed Durango, and appeared to be available to developers by mid-2012. Leaked documents suggested that the new console would include an improved Kinect sensor, cloud access to games and media, integration with phone and tablet devices, and technology to provide players heads-up displays on glasses worn by the player, codenamed "Fortaleza"; Microsoft did not comment on these reported features. Leaked design documents also suggested that Microsoft was seeking to eliminate the ability to play used games, though Microsoft later clarified it was still reviewing the design and were "thinking about what is next and how we can push the boundaries of technology like we did with Kinect", but did not comment on the validity of the information. The console was publicly unveiled under the name Xbox One on May 21, 2013 in a press conference designed to cover the unit's broad multimedia and social capabilities. A second press event for the console was held during E3 2013, focusing on its video game-oriented functionality. At that time, Microsoft announced that the console would be released in 21 different markets on November 22, 2013, but this was later amended down to 13. The change, which pushed the release date for the other eight markets to 2014, was attributed to unforeseen complexity in localizing the device's voice recognition capabilities. Later, in September 2014, the Xbox One was released in 26 markets, including remaining markets in Europe, the Japanese market, and Middle Eastern markets. Microsoft initially announced a different game licensing scheme for Xbox One than what was used upon its release: all games, including those purchased at retail, would be bound to the user's Xbox Live account. Users could access their purchased games from any other Xbox One console, play games without their disc once installed, and allow users to "share" their games with up to ten designated "family" members. Users would trade games at "participating retailers", and could also transfer a game directly to any Xbox Live friend on their list for at least 30 days, but only once. To synchronize licenses, the console would be required to connect to the internet once every 24 hours; if the console could not connect, all games would be disabled until the console was connected again. Reaction to this digital rights management scheme was extremely negative. Critics felt that the changes would infringe on consumers' first-sale rights for games purchased on physical media, as games would only be licensed to users rather than sold, and the disc itself would only be used to install the game and not confer ownership of its license or permission to resell. Microsoft also stated that publishers could impose restrictions or activation fees on second-hand copies of games. GameSpot editor Tom Mcshea went on to say that Microsoft had become anti-consumerist, trying to "punish their loyal customers" with strict restrictions, and that "by saying no to the used game restrictions and always-online that Microsoft is so happily implementing on the Xbox One, Sony has elevated the PlayStation 4 as the console to grab this holiday season." Xbox Chief Marketing and Strategy Officer Yusuf Mehdi explained that the system was built with digital distribution in mind, but that Microsoft wanted to maintain the availability of games on physical media. He also noted that Microsoft was not "giving in" to publishers' objections to used games, but rather trying to balance the needs of consumers and the industry, and that the trading and sharing abilities of the platform added a level of flexibility not seen on other online distribution platforms at the time. On June 19, 2013, shortly after E3 2013, Microsoft announced (in response to the negative reaction) that it would reverse its changes to Xbox One's DRM and game licensing model. As with Xbox 360, users would be able to share and resell physical games without restrictions, and beyond a mandatory software update upon the console's initial setup process to enable playback of Blu-ray and DVD video, the console would not require a permanent internet connection to operate. These changes required the family sharing features, along with the ability to play games without their disc after installation, to be dropped. Xbox One chief product officer Marc Whitten stated that the family sharing feature may return in the future, but could not be implemented on launch due to time restraints. Don Mattrick, the then president of Microsoft's Interactive Entertainment Business, stated that the licensing changes were in response to the negative public reaction. Other analysts believed that the change was in direct response of Sony's aggressive position during its E3 press conference. Mattrick, who had been a leader in Xbox One development, announced his departure from Microsoft on July 1, 2013, to become CEO of Zynga. Analysts speculated that his departure was predicated on the poor response and subsequent reversal of the plans for Xbox One. In 2015, four members of an international hacking group pleaded guilty to gaining unauthorized access to Microsoft's computer network and obtaining sensitive information relating to Xbox One and Xbox Live. At the time of the security breach, Microsoft was in the development stage for its next-generation gaming system. Between 2011 and 2013, the hackers spent hundreds of hours searching through Microsoft's network copying log-in credentials, source code, technical specifications and other data. Group members say they were driven by an immense curiosity about Microsoft's then-unreleased Xbox One console and associated software. "Using stolen access credentials", two of the hackers also committed a physical theft by entering "a secure building on Microsoft's Redmond Washington campus" and carrying away three "Durango" development kits. On June 13, 2016, during its E3 2016 press conference, Microsoft unveiled the Xbox One S, a revision of the original Xbox One hardware with a streamlined form factor. Microsoft also teased a high-end version of Xbox One with upgraded hardware codenamed "Project Scorpio", which was unveiled and released the following year as Xbox One X. The Xbox One S features a smaller casing and other design changes over the original model. The original Xbox One's exterior casing consists of a two-tone "liquid black" finish; with half finished in a matte grey, and the other in a glossier black. The matte side of the top of the console consists of a large air vent. The design was intended to evoke a more entertainment-oriented and simplified look than previous iterations of the console; among other changes, the LED rings used by Xbox 360 are replaced by a glowing white Xbox logo used to communicate the system's status to the user. Due to the overall ventilation design of the console, the original Xbox One is designed to only sit horizontally. Xbox One S utilizes a refreshed version of this design, with a case that is 40% smaller in size, and supports vertical orientation with a stand. The main Xbox One S SKU is colored in an entirely matte "Robot White" finish, with half of the console adorned with machined holes, and a visible circular vent on top of the console's right half. It utilizes push-button controls rather than capacitive keys, the side USB port and controller sync button were moved to the front of the console, and its power supply is integrated into the console's casing rather than sitting externally (plugging directly into the wall). Xbox One is powered by an AMD "Jaguar" Accelerated Processing Unit (APU) with two quad-core modules totaling eight x86-64 cores clocked at 1.75 GHz, and 8 GB of DDR3 RAM with a memory bandwidth of 68.3 GB/s. The memory subsystem also features an additional 32 MB of "embedded static" RAM, or ESRAM, with a memory bandwidth of 109 GB/s. For simultaneous read and write operations, the ESRAM is capable of a theoretical memory bandwidth of 192 GB/s and a memory bandwidth of 133 GB/s has been achieved with operations that involved alpha transparency blending. The system includes a non-replaceable hard drive and a Blu-ray Disc optical drive. 138 GB of hard drive space is used by the operating system, with the remainder available for the storage of games. Since the June 2014 software update, up to two USB drives can be connected to Xbox One to expand its capacity. External drives must support USB 3.0 and have a capacity of at least 256 GB. It was reported that 3 GB of RAM would be reserved for the operating system and utility software, leaving 5 GB for games. With DirectX 11.2 as the console's API, the graphics processing unit (GPU) is based on an AMD GCN architecture with 12 compute units, which have a total of 768 cores, running at 853 MHz providing an estimated peak theoretical power of 1.31 TFLOPS. For networking, Xbox One supports Gigabit Ethernet, 802.11n wireless, and Wi-Fi Direct. "We purposefully did not target the highest-end graphics. We targeted more as a broad entertainment play and did it in an intelligent way." The original Xbox One supports 1080p and 720p video output; unlike the Xbox 360, the Xbox One does not support 1080i and other interlaced resolutions. Xbox One supports HDMI 1.4 for both input and output, and does not support composite or component video. Xbox One supports 7.1 surround sound, Dolby Atmos, and DTS X.
Xbox One S additionally supports 2160p (4K resolution) video output, and high dynamic range (HDR) color using HDR10 (with a future update to add Dolby Vision HDR support for streaming video). 4K video can be played from supported streaming services and Ultra HD Blu-ray Disc, Games are upscaled from 1080p resolution, and are not rendered at 4K. The GPU on Xbox One S has a higher clock speed and ESRAM bandwidth than the original model, which can provide some performance improvements on games with dynamic resolution scaling or uncapped frame rates. The console can monitor its internal temperature and adjust accordingly to prevent overheating; alongside increasing fan speed, additional measures can be taken, including forcing the hardware to run in a lower power state—a feature that was not present on Xbox 360. Restricting power consumption lowers maximum performance, but the setting would be intended as a last resort to prevent permanent hardware damage. The Xbox One's controller maintains the overall layout found in the Xbox 360's controller, but with various refinements to its form. Among its changes include a smoother form, textured analog sticks, a four-way directional pad, and redesigned triggers and shoulder buttons with a curved shape for ergonomics. "Menu" and "View" buttons have replaced the Start and Back buttons. Each trigger features independent rumble motors called "Impulse Triggers", which allows developers to program directional vibration. One trigger can be made to vibrate when firing a gun, or both can work together to create feedback that indicates the direction of an incoming hit. The controller also contains light emitters that allow it to be tracked and paired using the Kinect sensor, and to detect when it's not being held to automatically enter a low-power state. An updated revision of the controller was released in June 2015, which includes a 3.5-millimeter headphone jack and other minor changes. A third revision was introduced alongside and first bundled with Xbox One S, with textured grips and Bluetooth support. The Xbox One controller includes a micro USB port; when attached via a micro-USB cable, the controller can operate without battery power and can charge remotely, and is supported on computers running Windows 7 or later with drivers. The Xbox One Wireless Adapter accessory allows wireless use of Xbox One controllers on Windows computers also running Windows 7 or later. The Elite Wireless Controller was released in October 2015. It was described and marketed as "an elite controller for the elite gamer", containing interchangeable parts, "hair trigger locks" for the triggers that allow users to reduce the amount of distance they must be pressed to register a press, and software for remapping buttons. In May 2018, Microsoft announced the Xbox Adaptive Controller—a special controller designed for users with disabilities. It features two large dome-like buttons, and a series of connectors corresponding to standard Xbox controller buttons—which are used to attach specific types of buttons and other assertive peripherals. The controller can also be used in conjunction with Copilot—a feature introduced in 2017 that allows multiple controllers to be used in tandem on behalf of a single player. As of the November 2018 update, developers may now optionally allow their titles to support computer mice and keyboards as input. Microsoft also unveiled an exclusive partnership with Razer Inc. to produce a specific line of Xbox-optimized keyboard and mice peripherals, with Xbox system keys and support for Razer's Chroma LED lighting platform. The Kinect 2.0, an updated natural user interface sensor, was redesigned and recreated to provide motion-tracking and voice commands for the Xbox One. Kinect 2.0 features a wide-angle time-of-flight camera and a 1080p camera, in comparison to the VGA resolution of the Xbox 360 version, and processes 2GB of data per second to map its environment. Kinect 2.0 has an improved accuracy over its predecessor; it can track up to 6 people simultaneously, referred to as "skeletons", perform heart rate tracking, track controller gestures, and read QR codes to redeem Xbox Live gift cards. By default, voice recognition is active at all times, so the console can receive voice commands from the user, even when the console is in sleep mode. It is possible to wake the console with a command, although settings are available to change which individual Kinect functions are active. Prior to and after the mandate, all Xbox One consoles initially shipped with the Kinect sensor included. On June 9, 2014, cheaper Xbox One bundles were introduced, which did not include the Kinect sensor. Microsoft stated the decision to offer Xbox One bundles without Kinect was to "[offer] a choice to people that would allow people to buy an Xbox One and then ramp up to Kinect when they can afford to", while also allowing games to use processing power that was previously reserved for Kinect. An updated Xbox Development Kit issued in June 2014 allows developers to explicitly disable motion tracking functionality in games, allowing access to additional system resources that represent about 10% of the GPU processing power. These resources were previously reserved for Kinect skeletal tracking, regardless of whether the Kinect sensor was attached or in use. A Windows compatible Kinect 2.0 was released on July 15, 2014. Kinect 2.0 was released as a standalone and optional item in October 2014; it is bundled with a digital copy of Dance Central Spotlight. Xbox One S lacks the Kinect connection port, requiring a USB/power adapter to use the accessory. A free USB adapter was provided by Microsoft to Kinect owners who registered their ownership of Kinect and Xbox One S online up until March 2017. The adapter was sold separately thereafter, but has since been discontinued. Kinect for Xbox One was officially discontinued on October 25, 2017. Xbox One's user interface uses Microsoft's Fluent Design System; previous iterations of the console's software used the Metro design language. The dashboard is divided into "Home", "Mixer", "Community", "Entertainment", and "Store" sections, with the "Home" page further divided into "blocks" that can display pinned games/apps, as well as other content. Pressing the Xbox Guide button opens a sidebar with access to common functions such as the friends list, apps, the user's party, and settings. Users can go back to the dashboard while using games or apps using either the Xbox button on their controller or a voice command; up to four apps can run (either actively or in the background) at once, but only one game can run at a time. Use of Kinect enables the ability to control the console via voice commands. Xbox One's voice control capabilities are similar to, albeit richer than those of Xbox 360. The voice assistant Cortana was added in 2016 to provide expanded voice command functionality with natural language recognition. The dashboard originally used a layout similar to Windows 8's "Start screen", with a horizontal-scrolling, tile-based interface. This design was replaced for Xbox Preview Program members in September 2015 with the current interface, known as "the New Xbox One Experience", which was publicly released as part of the November 12, 2015 system update. Alongside its new layout, support for Kinect motion controls on the dashboard were removed. The UI was refreshed again in April 2017, adding the new Guide sidebar and other new features. At this time, the ability to "snap" apps as a sidebar for multi-tasking was removed. The UI was further revamped in October 2017 to use elements of Windows 10's forthcoming design language, and adds a new, lighter color scheme option for the console's user interface. The Xbox One can view and play content from DLNA servers and USB storage devices using the "Media Player" app. An application allows playback of video from Blu-ray Disc, DVD and CD media. The console provides the ability to feed live television by serving as an HDMI pass-through for an existing television provider's set-top box or an optional Digital TV Tuner accessory that allows use of digital terrestrial television. The console provides its own electronic program guide known as OneGuide, augmenting the existing streaming functionality to provide show recommendations based on viewing history, integrated access to "App Channels" corresponding to online video services, and voice control via Kinect. The set-top box and television are controlled by OneGuide using an IR blaster. The Xbox One does not provide full DVR functionality for recording television programs: executive Yusuf Mehdi indicated that the console would "work in tandem" with existing television services, but that Microsoft would need to work with them directly to provide extended functionality, such as DVR integration. The digital TV tuner accessory allows limited DVR functionality for pausing and rewinding live TV for up to 30 minutes. In June 2016, Microsoft announced that their plans for full DVR functionality for the Xbox One were on hold. The Xbox Live service has been scaled up to use 300,000 servers for Xbox One users. Cloud storage is available to save music, films, games and saved content, and developers are able to use Live servers (along with the Microsoft Azure cloud computing platform) to offer dynamic in-game content and other functionality. Users can have up to 1,000 friends. The December 2016 software update added the new social networking feature Clubs, which allows users to join groups focused on specific interests or games, and Looking for group (LFG), a system to help users locate players to join their party for multiplayer play. Players can use the Upload Studio app to edit and share clips from the last five minutes of gameplay footage that is automatically recorded by the console. Games can also be developed so that recording can automatically be triggered in response to notable events, such as achievements. Xbox One supports streaming directly to the services Mixer and Twitch. Users can use voice commands to immediately begin streaming footage of their current game directly to the service, and use Kinect's camera and microphone to record video and audio narration. Users can feature recorded clips on their Xbox Live profile page in a "Showcase" section. As with Xbox 360, premium online features such as multiplayer, voice communication, broadcasting and Upload Studio require an Xbox Live Gold subscription to use. Unlike Xbox 360, a user's Xbox Live Gold subscription benefits apply to all other users of their designated "home" console as well, rather than requiring a separate subscription for each user. Since June 2014, applications no longer require an Xbox Live Gold membership to use. Additional subscriptions for outside services such as Netflix may still be required. Microsoft also extended its Games with Gold program to Xbox One, providing free Xbox 360 and Xbox One games to Xbox Live Gold subscribers on a monthly basis. The Xbox SmartGlass app provides extended functionality on Xbox One, allowing devices running Windows Phone, Windows 8, iOS and Android to be used as a companion device for Xbox One features, such as powering on the console, a remote control, accessing messages and the Activity Feed, purchasing content, and providing integration with certain games and content. The SmartGlass app can also be used to stream live television to Android and Windows devices if the console is using a USB digital television tuner. On Windows 10, SmartGlass is succeeded by the Xbox App, which supports the local streaming of games from Xbox One to personal computers and tablets running Windows 10. An Xbox One controller must be used, but Windows-compatible headsets and microphones can be used for voice chat. Games requiring Kinect are not supported, while Game DVR and online streaming are not available while using this functionality. Per a partnership with Oculus VR, users will also be able to stream Xbox One games to the Oculus Rift virtual reality headset by means of Xbox app for Windows 10; as of 2015 there were no immediate plans for direct integration between Xbox One and Oculus Rift. Xbox One games are distributed physically on Blu-ray Disc, and digitally as downloads through Microsoft Store (formerly Xbox Games Store). All Xbox One games must be installed to the console's storage: users can begin to play portions of a game (such as opening levels) once the installation or download reaches a specific point, while the remainder of the game is downloaded or installed in the background. Updates to games and system software are also downloaded in the background and while in standby. If the game is installed from physical media, the disc is still required for validation purposes. If the game is installed on another console, and that console owner no longer has access to the disc, the owner has the option of unlocking the install on their hard drive by purchasing it through Xbox Live; the installed game then acts as a game installed on the hard drive. An active internet connection may be required for some games, particularly those that rely on server-side processing. Microsoft introduced an Early access program known as Xbox Game Preview in 2015, which allows developers to launch unfinished games for consumers to purchase and beta test before its official launch. Since June 2017, games may be promoted with additional icons that denote compatibility with hardware enhancements found in newer Xbox One models, including support for high-dynamic-range (HDR) colors (on Xbox One S and Xbox One X), native rendering at 4K resolution (Xbox One X), and specific optimizations for Xbox One X. In February 2017, Microsoft introduced a subscription "on-demand" service known as Xbox Game Pass, separate from Xbox Live Gold, which allows users to download and play games from its library at no additional charge for the life of the subscription. In April 2019, Microsoft also introduced Xbox Game Pass Ultimate, which bundles Game Pass with an Xbox Live Gold subscription. "Absolutely; you can certainly plug an Xbox 360 in the back – that was one of my first questions when I heard about the [HDMI-in] feature,"
At its launch, the Xbox One did not have native backward compatibility with original Xbox or Xbox 360 games. It had been a desired launch feature by Microsoft and had been actively under development as early as 2007 under the "Trioxide" program as to get Xbox 360 code to run on 64-bit hardware. Rather than going the route of the initial PlayStation 3 which included a core PlayStation 2 system-on-a-chip processor, the Xbox One hardware was designed to include support for Xbox 360 XMA and texture processing on hardware, knowing this would be difficult to replicate in software. Following criticism of its plan for an "always on" console from the May 2013 announcement, Microsoft had to put significant effort to prepare the Xbox One software for a revised approach, and the backwards compatibility development work were put on hold. Interim solutions were suggested: senior project management and planning director Albert Penello explained that Microsoft was initially considering a cloud gaming platform to enable backward compatibility, but he felt it would be "problematic" due to varying internet connection qualities. Xbox Live director of programming Larry "Major Nelson" Hryb did state that users could theoretically use the HDMI-in port on the console to pass an Xbox 360 (or, alternatively, any other device that supports HDMI output, including competing consoles) through Xbox One. This process does generate a small amount of unnoticeable display lag. Following the release of the Xbox One and transition of Phil Spencer to the head of the Xbox division in 2014, he and software engineering vice president Kareem Choudhry restarted the backwards compatibility program in relative secret within the company. Choudhry brought on previous engineers that worked on Trioxide, including Kevin La Chapelle, Jonathan Morrison, and Barry Bond, to restart the program. The team chose to start with Castle Crashers, which included Xbox networking features, to test backwards compatibility. Castle Crashers frequently crashed to a screen with alphanumeric codes, which La Chapelle was able to obtain from the game's developers, The Behemoth, which helped them to rapidly diagnose problems and fix the compatibility issues. Solving most of the major problems through Castle Crashers, the background compatibility team decided to let the program be announced at E3 2015 with plans to have one hundred titles available by the end of 2015. However, by E3, they still found problems with some games running at extremely low framerates. During the event, Morrison recognized that a fundamental difference between the Xbox 360 and Xbox One was its scheduling rate, and when they returned, Morrison's idea helped them to rapidly complete work to meet its promised goal by the end of that year. Individual games still brought some difficulty, specifically Halo: Reach, but this prompted the team to develop automatic tools that could be used to identify where Xbox 360 titles would be difficult to run as-is on the Xbox One and how to work around those; this further set up the potential to improve Xbox 360 games on the future iterations of the Xbox One, such as the Xbox One X to improve graphics support. Xbox 360 backward compatibility uses a "Fission", a software emulator within the system software; 104 Xbox 360 titles were supported at the feature's public launch, with more added in the following months. Xbox 360 games contained within Rare Replay are packaged as standalone applications using the Xbox 360 emulation. Microsoft stated that publishers would only need to provide permission to the company to allow the repackaging, and it expected the number of supported games to increase significantly over time. Microsoft, along with fourteen other third-party publishers, will offer supported games, and all Games with Gold titles on Xbox 360 since November 2015 are made compatible. The first Xbox videogame revealed to be compatible with the Xbox One was Crimson Skies: High Road to Revenge. Xbox division head Phil Spencer had also hinted the possibility of adding support for games from the original Xbox. For the backwards compatibility team, after they completed the framework for Xbox 360 compatibility so that other engineering teams could take over, they turned to the question of compatibility with the original Xbox console. The program was started in November 2016, under the code name "Fusion", and was led by software engineer Spencer Perreault. Perreault initially tried the same approaches as the team had done with "Fission", but due to the differences in memory management sizes and chipset bit-rates, these initial tests failed. Instead, Perreault worked to bring "Dolphin", a developer tool for the original Xbox, working to get its emulation correct. La Chapelle brought in a number of personal Xbox titles to test in Perreault's emulation, getting about a 10% "hit rate" on successes, though the variety of failures helped Perreault to identify common problems, and within a month, had improved the successful hit rate to about 90%. As with Xbox 360 backwards compatibility, the Fusion emulation enables Xbox games to be scaled to 1080p resolutions, work with Xbox One networking features, and can allow mixed-console System Link connection between all three generations of Xbox. With Perreault's success, Microsoft announced the Xbox backwards compatibility on the Xbox One in June 2017. Thirteen titles were initially released on October 24, 2017. Microsoft announced an additional 19 titles to be added to the Xbox One service during April 2018. Microsoft does not anticipate that there will be as many Xbox titles brought to the program as with the Xbox 360, primarily due to legal issues related to intellectual property, contracts, and companies that have since gone defunct. While the initial unveiling of the Xbox One in May 2013 created criticism that led to significant changes in the digital rights management scheme it would use, other features of the console were highlighted by journalists. The editorial staff of Game Informer offered both praise and criticism for the console. Matt Helgeson described the console as Microsoft's intent to "control the living room". He called Xbox One's instant switching features "impressive", and that the console was "a step in the right direction" with regards to TV entertainment, especially the prospect of avoiding the usage of non-intuitive user interfaces often found on cable set-top boxes. Jeff Cork said that Microsoft had "some great ideas" for the console, but that it failed to properly communicate them. Microsoft's E3 2013 press conference was criticized for focusing too much on games that, beyond increased graphical capabilities, provided experiences that were otherwise similar to previous-generation games—giving little incentive for buying the new console. Rafi Mohammed, author of "The Art of Pricing", felt that Microsoft priced Xbox One "too high" and that the $100 premium over its competitor could "derail" the system during the 2013 holiday season. Upon its release, the Xbox One received favorable reviews from critics and reviewers. In its launch review, Polygon gave the Xbox One an 8/10. Its design was described as "inoffensive" but its larger size noted, while the console's quieter and cooler operation was praised for indicating a potentially higher reliability than Xbox 360 was on-launch. The controller was praised for its battery life and "premium" design, but some members of the site's staff felt that its shoulder buttons were stiffer than that of previous designs. The design of Xbox One's interface received mixed reviews: noting that it carried over Windows 8's design language, the interface was disfavored for hiding functions under the controller's menu button and for being awkward to use with a controller or motion gestures, seemingly encouraging users to use voice navigation instead. While praised for having more "robust" voice navigation than Xbox 360, they felt that voice navigation still had a "learning curve in understanding what works and what doesn't." Although its user following, Smart Match, and improved voice chat features were noted, Xbox Live was panned for not offering the option on-launch to add a real name to user profiles. Despite a regression in local and network multimedia functionality in comparison to Xbox 360 and how OneGuide interacted with outside set-top boxes (drawing comparisons to the operations of TiVo DVRs), Polygon felt the Xbox One's overall multimedia experience "feels like a major step forward in set-top boxes and makes the Xbox One the obvious center of any living room that has one." Ben Gilbert of Engadget was similarly modest upon its launch, assigning the console a score of 81/100 and describing the Xbox One's design as a "1993 artist's rendering of 2013's technology". Acknowledging that its controller was a mere refinement of the "ubiquit[ous]" Xbox 360 design, he praised the controller for its improved D-pad and quieter triggers but criticized its stiff shoulder buttons. Kinect received positive reviews for its face recognition login and improved motion tracking, but that whilst "magical", "every false positive or unrecognized [voice] command had us reaching for the controller." The overall interface was also considered more intuitive and flexible than that of PlayStation 4, but its game library view was described as being a "jumbled, sadly unfilterable rows of every owned piece of software", that also knowingly listed games that require their disc to run alongside those which did not. The console was also panned for missing certain promised features on-launch, such as Upload Studio, game streaming, and certain apps/services. Later on, critics felt that the Xbox One's functionality had matured over the year following its launch; Jeff Bakalar of CNET, assigning it a score of 8/10, acknowledged improvements to Xbox One's software since its original release, but that its user interface was still unintuitive in comparison to Xbox 360 and PlayStation 4, explaining that "navigating the interface seems to be much more problematic than it rightfully should be, and there's simply not enough transparency in the logic within it. There are oddities peppered throughout, which is the root for countless headaches and frustrations." Xbox One's in-game performance was mixed, with some titles showing slower performance over PS4, but some multi-platform games performing better on Xbox One than PS4. CNET praised the wider lineup of multimedia services and apps on Xbox One over PS4, not requiring Xbox Live Gold for online save data storage, support for high-speed USB 3.0 as secondary storage, and having a "slightly better" lineup of upcoming exclusives, concluding that "While the PS4 had a clear advantage at launch, that edge is slowly evaporating as Microsoft has worked feverishly to undo most of the Xbox One's original missteps." Nick Pino of TechRadar, giving it four stars out of five, similarly felt that the Xbox One "[felt] more like a media titan today than it did 12 months ago," citing OneGuide, Upload Studio, and Microsoft's decision to drop the Xbox Live Gold requirement for multimedia streaming apps, and that "there's still a lot of potential locked away inside the hardware of the system that developers are just beginning to figure out. So while PlayStation might have the upper hand for now when it comes to certain third-party titles, it may not always remain that way. Just how Microsoft will get it to that point, though, is still a mystery." However, he disfavored the console's dependence upon a subscription for most of its functionality, Kinect's voice recognition, and that some games do not natively run at 1080p resolution, but are upscaled. In an August 2016 review of the Xbox One S model, TechRadar further commended Microsoft's recent improvements to Xbox One, citing a strong lineup of first-party titles in 2015 and further improvements to the console's interface. Alaina Yee of IGN also praised how Xbox One had evolved since its launch, assigning it with Kinect a score of 8.1/10 and acknowledging that Microsoft had "made good on its promise of listening to consumers, rolling out a steady stream of updates that have both broadened and deepened what this third Xbox console offers." Regarding the console's slightly lower level of graphics capabilities in comparison to PlayStation 4, it was noted that "while videophiles might spot instances of upscaled graphics and less detailed environments immediately, most people generally won't notice a difference between Xbox One and PlayStation 4 versions of a game (when there is one) unless they see both running side by side", and examples of "gorgeous" Xbox One games were noted, such as Sunset Overdrive and Forza Motorsport 5. The number of "hidden" options in Xbox One's user interface was equated to "hunting for treasure in a messy room"; as such, Kinect voice commands, in combination with access to common functions within the Xbox SmartGlass app, were praised for helping to provide a more streamlined user experience. The Xbox One S revision was critically praised for its improvements over the original model, including its streamlined design, the addition of HDR and 4K video support, and visual improvements on some games (such as Fallout 4 and Rise of the Tomb Raider) when upscaled to 4K. However, TechRadar noted regressions such as the lack of a Kinect port (considered "one last kick in the pants for all the gamers forced into buying the more expensive console bundle two short years ago"), and concerns that the revised hardware and HDR support would lead to fragmentation of Xbox One's ecosystem, as not all users will necessarily experience a game the same way. Dieter Bohn of The Verge similarly felt that although it was one of the cheapest 4K Blu-ray players on the market, consumers were more interested in streaming 4K content (which could be accomplished with cheaper digital media players) than 4K Blu-ray discs, and noted the small number of HDR-enabled games on launch. Bohn concluded that the Xbox One S would appeal best to new owners or those who wish to leverage its HDR and 4K support, but recommended that existing owners consider Xbox One X instead. The Xbox One platform has faced criticism for lacking in exclusive releases over competitors such as PlayStation 4 and Nintendo Switch. Although there have been releases in flagship Microsoft franchises such as Forza and Halo, they have underperformed in comparison to other entries, while several major Xbox One exclusives have faced notable delays, such as Crackdown 3, or outright cancellations, including Fable Legends and Scalebound. By contrast, PS4 and Switch have seen a large number of critically successful first- and third-party exclusives, and Activision would sign with Sony Interactive Entertainment for timed exclusivity on certain add-on content in the Call of Duty and Destiny franchises—the former having replaced a previous deal with Microsoft. An analyst also noted that Microsoft's first-party studios were not as strong as those of Sony, explaining that "Sony has always been about first party and Microsoft wanted to emulate that, but they allowed studios like Rare and Lionhead to fade away." In 2018, Microsoft acquired a large number of third-party studios, including Compulsion Games, InXile Entertainment, Ninja Theory, Obsidian Entertainment, Playground Games, and Undead Labs, and hired former Crystal Dynamics head Darrell Gallagher to lead a new Microsoft studio known as The Initiative. In 2016, Microsoft began to make future Xbox One-exclusive first-party releases simultaneously available on Windows 10 PCs, with digital cross-buy support via Microsoft Store under the branding Xbox Play Anywhere. This, thus, makes the games Microsoft platform exclusives rather than Xbox One exclusives. Microsoft has used the branding "console launch exclusive" to refer to titles (such as PlayerUnknown's Battlegrounds) that are timed or permanent exclusives to Xbox console hardware, but were already available on, or are planned to be available on PC. Microsoft initially imposed policies referred to as the "parity clause" on indie games, which required that the Xbox One version of a game be released at the same time as versions on other platforms. Phil Spencer stated that this rule was intended to ensure that Xbox One was a "first-class" platform by discouraging staggered releases. However, these policies resulted in some studios, such as Vlambeer (developer of Nuclear Throne) choosing to negotiate console exclusivity with Sony instead, who proved to be more receptive to indie development. By July 2015, Microsoft had changed its policies in response to the criticism, with Spencer admitting that this policy was onerous on smaller studios. Spencer also stated that Microsoft was willing to work with studios to help make the Xbox launches of former timed exclusives "special in some way", so that customers are not simply purchasing "last year's game". Microsoft only publicized its sales figures during the first year after release. The last official figure was released in November 2014, with the company announcing in October 2015 that it would no longer publish sales figures for the system. On November 22, 2013, Microsoft confirmed that it had sold one million Xbox One consoles within its first 24 hours of being available. Based on approximately 102,000 shopping receipts tracked by InfoScout, 1,500 of which included a purchase of either a video game or a video game console, the Xbox One was the highest-selling console during the Black Friday sales period in the United States. On December 11, 2013, Microsoft announced that it had sold approximately 2 million units in its first 18 days on sale. On December 12, 2013, Microsoft announced it was the fastest selling console in the United States, based on NPD Group figures, however the NPD report clarified, "PlayStation 4 sales included an additional week within the November data month compared to Xbox One. When looking at sales on an average per-week basis, Xbox One led PS4. Keep in mind, however, that supply typically becomes constrained in the second week after launch." On January 6, 2014, Microsoft announced that approximately 3 million consoles had been sold worldwide in 2013. In their Q2 2014 earnings report on January 23, 2014, Microsoft announced that 3.9 million Xbox One units had been shipped worldwide. On November 12, 2014, Microsoft announced it had shipped almost 10 million units to retailers worldwide. The company also revealed that a price cut had tripled U.S. sales of the console over the previous week. On December 11, 2014, Microsoft announced, based on NPD Group figures, that Xbox One was the best-selling console in November 2014. With Microsoft's October 2015 announcement that it would no longer publish sales figures for the system, the 10 million figure from November 2014 is still the latest official cumulative sales number. Some journalists think that its lower sales figures than rival PlayStation 4 is the reason behind the decision, to make their system not look "bad" compared to Sony's. The Xbox One has sold poorly in Japan, continuing the trend of Microsoft's previous consoles which have struggled against the local Sony and Nintendo. The Xbox One sold a total figure of 23,562 consoles within its launch week. By comparison, the Xbox 360 sold 62,000 consoles in Japan during its opening week in 2005. In the week ending June 14, 2015 the Xbox One sold just 100 consoles in Japan; in the same week the Wii U sold 16,413 consoles. In January 2016, the CFO of Electronic Arts reported during a financial call that the Xbox One has sold "around 18 to 19 million" units. That is half the 36 million units of the PlayStation 4 that Sony claimed at the time. However it is higher than Nintendo's Wii U which managed 12.5 million. Research firm IHS Markit estimated 39.1 million units were sold by the end of March 2018. Video game industry analyst Daniel Ahmad estimated that approximately 41 million units had been sold through 2018. On launch, Xbox One was available in a single retail configuration, which included the console with 500 GB hard drive, one controller, and Kinect sensor. In the United States, it retailed for US$499. On June 9, 2014, Microsoft released a new Xbox One retail configuration that excludes the Kinect sensor, costing US$399. A standalone Kinect sensor for Xbox One for use with these models was released in October 2014, retailing at US$150. On June 16, 2015, Microsoft lowered the price of the stock model to US$349, and released a new US$399 model containing a 1 terabyte hard drive and in some markets, Halo: The Master Chief Collection. In May 2016, Microsoft lowered the price of selected 500 GB bundles to US$299, and 1 TB bundles to US$319 as a limited time offer of unspecified length. On June 14, 2016, the price of 500 GB models was lowered once more to US$279 through October 2016, in anticipation of the launch of Xbox One S.
On August 31, 2015, Microsoft announced Xbox One Elite—a new SKU with a 1 TB solid-state hybrid drive and an Elite controller. It was released in November 2015 and retails for US$499.99. In the US, the Elite bundle was a timed exclusive to GameStop and Microsoft Store. Those who pre-ordered Xbox One for its release received a special "Day One Edition", which featured a "DAY ONE 2013" inscriptions on the controller, and a unique achievement. A white "Launch Team" edition was given exclusively to Microsoft staff members, featuring the inscription "I made this, LAUNCH TEAM 2013" on the console and controller, and was bundled with Dead Rising 3, Forza Motorsport 5, Ryse: Son of Rome, and Zoo Tycoon. A similar limited edition was gifted to Respawn Entertainment employees following the release of Titanfall, with a black, white, and orange color scheme and a similarly styled controller inspired by the game (the controller itself would be released publicly as a tie-in). Xbox One consoles bundled with digital copies of specific games have also been released, including Titanfall and Forza Motorsport 5. In October 2014, a non-Kinect bundle featuring a white Xbox One and a coupon for a digital copy of Sunset Overdrive was released, marking the first public availability of white Xbox One models. A similar white hardware bundle was released for Quantum Break. In November 2014, a limited edition 1 TB bundle was released for Call of Duty: Advanced Warfare, with a "worn", militaristic grey and black color scheme with gold accents and insignia detailing (including the emblem of the Sentinel Task Force), customized hardware sound effects for the power and eject buttons, and a matching controller. It is bundled with a coupon for a digital copy of Advanced Warfare's "Day Zero" edition, which offered the pre-order incentives of pre-release access and special in-game items. 512 GB Assassin's Creed bundles were released in November 2014, which shipped with coupons for digital copies of both Assassin's Creed Unity and Assassin's Creed IV: Black Flag. This bundle was available with and without Kinect, with the Kinect version also including a coupon for a digital copy of Dance Central Spotlight. Another non-Kinect bundle was released in March 2015 that includes a coupon for a digital copy of Halo: The Master Chief Collection. A 1 TB Forza Motorsport 6 bundle was released on September 15, 2015, which features blue-colored hardware with racing stripes and a push-button start-inspired design around the power button, and customized hardware sound effects. A limited-edition 1TB Halo 5: Guardians bundle was released on October 20, 2015 (one week before the launch of the game itself), and features a gunmetal gray finish with metallic blue accents, military insignia detailing, and customized hardware sound effects. In August 2018, Microsoft announced that it would, for a limited time, offer a financing program known as Xbox All Access through Microsoft Store in the United States. The program will allow users to purchase an Xbox One S or X console, bundled with subscriptions to both Xbox Live Gold and Xbox Game Pass, financed over a two-year contract. The customer retains ownership of the console after the two years, and if they break contract prior to that, they must pay the difference on the remaining console cost. The pricing is set to be cheaper overall than purchasing the individual elements alone. Xbox One S is available in 500 GB, 1 TB, and "special edition" 2 TB models, which originally retailed at US$299, $349, and $399 respectively. The 2 TB model was released on August 2, 2016, and 1 TB and 500 GB models were released on August 23, 2016. and a Gears of War 4 special edition was also released. On June 11, 2017, Microsoft lowered the prices of the 500 GB Battlefield 1 and 1 TB Forza Horizon 3 Xbox One S console bundles by US$50. At Gamescom 2017, Microsoft unveiled a 1 TB Minecraft limited edition, with a grass block-themed hardware and a Creeper-themed controller. During an Inside Xbox livestream in September 2018, Microsoft unveiled a 1 TB Fortnite Battle Royale bundle, with online codes to acquire unique in-game Eon-themed items and currency. On October 9, 2018, Microsoft announced that they would be releasing a 1 TB Minecraft Creators bundle, with a download code for Minecraft, in-game currency, DLC packs, and a free trial for Xbox Game Pass and Xbox Live Gold. On April 16, 2019, Microsoft unveiled an "all-digital edition" Xbox One S configuration, which excludes the Blu-ray Disc drive. It is a 1 TB model sold at a price of US$249, and is pre-loaded with Forza Horizon 3, Minecraft, and Sea of Thieves. The console is set for release on May 7, 2019. Xbox One X is a high-end hardware revision of Xbox One. First teased at E3 2016 under the codename "Project Scorpio", Xbox One X was released on November 7, 2017, with a 1 TB model priced at US$499, and a limited, pre-order exclusive "Project Scorpio Edition", with a dark gradient finish, vertical stand brace and green "Project Scorpio" inscriptions on the console and bundled controller. Xbox One X features upgraded hardware that is designed primarily to render games at 4K resolution, and provide performance improvements for existing games; they can be displayed at full resolution on 4K displays, or supersampled for lower resolutions displays. It uses a system-on-chip (SoC) known as Scorpio Engine, which incorporates a 2.3 GHz octa-core CPU, and a Radeon GPU with 40 Compute Units clocked at 1172 MHz, generating 6 teraflops of graphical computing performance. It also includes 12 GB of GDDR5 RAM, 9 GB of which is allocated to games. Scorpio Engine's CPU utilizes a custom platform designed to maintain compatibility with the Jaguar CPU of the original Xbox One, but with a 31% increase in performance; the custom platform is unrelated to AMD's current Ryzen architecture. The console uses a vapor chamber method of cooling for the SoC, and motherboards are tailored to the exact voltage needs of each individual Scorpio SoC to optimize their output and energy usage. The console also supports AMD's FreeSync technology, 1440p resolution, and/or 120 Hz refresh rate on compatible displays. Xbox One X is compatible with all existing Xbox One software and accessories. To assist in optimizing the new hardware to run existing games at 4K resolution, Microsoft developers used internal debugging software to collect GPU traces from major titles that did not run at full 1080p resolution on the original Xbox One. Halo 5: Guardians, which uses a scaling system that dynamically lowers the game's resolution when needed to maintain a consistent frame rate, was able to run at its native resolution with no scaling on Xbox One X hardware. Phil Spencer also touted that Xbox One X's hardware could also be used to support virtual reality, due to its power, price point, and convenience. At the 2017 Game Developers Conference, Microsoft announced plans to support Windows Mixed Reality VR headsets on Xbox One in 2018, but the company later stated that it was initially focusing on PC platforms first, and that it wanted to focus on wireless VR solutions for consoles. Games marketed by Microsoft as Xbox One X Enhanced have specific optimizations for graphical fidelity on the console's hardware. Separate iconography is being used to denote games that natively run at 4K resolution, or support HDR. Existing games can be updated to provide these enhancements. Though Xbox Games marketing head Aaron Greenberg stated that Xbox One X will have no exclusive titles, general manager of game publishing Shannon Loftis remarked in a follow-up interview that she was not sure on this point, and exclusivity would be "up to the game development community what do they want to do." The Xbox One X has been said to be a competitor to the PlayStation 4 Pro, a hardware update of the PlayStation 4 released in late 2016 that similarly focuses on 4K gaming and improved virtual reality performance, although Phil Spencer stated that the PlayStation 4 Pro's competition is instead the Xbox One S. In October 2016, Penello stated that the performance advantage of the Xbox One X over the PS4 Pro would be "obvious", noting that the PS4 Pro's GPU only had 4.2 teraflops of graphical computing performance in comparison to Microsoft's stated 6 teraflops. Some journalists thought that Microsoft's messaging and positioning of Scorpio alongside the release of the Xbox One S were at odds with themselves and was "confusing". ^ Only the model launched in 2013 came bundled with Kinect. Subsequent models did not include the Kinect, and Xbox One S and One X models dropped the Kinect-specific port. ^ Special launch edition with limited availability. ^ Price at launch. Subsequent price reductions are explained in the attached notes. ^ a b Price cut by $50 in June 2017 ahead of Xbox One X launch. 500 GB models cut to $249 and 1 TB models cut to $299. ^ Retail price dropped to $349 in June 2015, $299 in May 2016 before Xbox One S launch, and finally $279 in June 2016 after Xbox One S launch. ^ Retail price dropped to $319 in May 2016 ahead of Xbox One S launch. ^ Taipei, Aaron Lee; Taipei, Ocean Chen; Tsai, Joseph (September 4, 2013). "Flextronics lands 90% of Xbox One orders, leaving Foxconn the rest". DigiTimes. Retrieved December 8, 2016. ^ a b c Warren, Tom (June 10, 2013). "Xbox One launching in November for $499 in 21 countries, pre-orders start now". The Verge. Vox Media. Retrieved June 10, 2013. ^ Neltz, András (July 30, 2014). "The Xbox One Will Be China's First Major Home Console Since The PS2". Kotaku. Univision Communications. Retrieved December 6, 2016. ^ "Microsoft's Xbox One Sales Hit 3 Million". Xbox Wire. Microsoft. January 6, 2014. Retrieved December 8, 2016. ^ a b MacGregor, Kyle (November 13, 2014). "Xbox One's Approaching 10 Million Units Shipped". Destructoid. Retrieved July 20, 2015. ^ a b As of December 31, 2013[update], 3 million sold. As of November 2, 2014[update], approximately 10 million shipped. These amounts are outdated, however. Microsoft has not released more recent figures. ^ a b Stein, Scott (June 19, 2013). "Microsoft Xbox One — Consoles — CNET Reviews". CNET. CBS Interactive. Retrieved June 24, 2013. ^ a b c Shimpi, Anand Lal (May 23, 2013). "AMD's Jaguar Architecture: The CPU Powering Xbox One, PlayStation 4, Kabini & Temash". AnandTech. Purch Group. Retrieved June 24, 2013. ^ Sherr, Ian (June 12, 2017). "Microsoft Xbox One X specs — Consoles — CNET Reviews". CNET. CBS Interactive. Retrieved June 30, 2017. ^ "Xbox One S vs Xbox One: What about Project Scorpio?". Xbox Support. Microsoft. Retrieved February 19, 2017. ^ Walker, Tim (May 22, 2013). "Xbox ONE: 'The ultimate all-in-one home entertainment system': Microsoft finally unveils its latest console". The Independent. Independent Print. Retrieved May 23, 2013. ^ Remo, Chris (November 21, 2005). "Waiting for the Xbox 360". Shacknews. Gamerhub. Retrieved June 23, 2015. ^ "Unboxing the Xbox 360 Super-Slim". IGN. Ziff Davis. June 18, 2013. Retrieved June 22, 2015. ^ Martin, Matt (June 10, 2010). "Kinect to extend Xbox 360 lifecycle by five years". Computer & Video Games. Future plc. Archived from the original on November 8, 2011. Retrieved June 26, 2013. ^ Goldfarb, Andrew (October 5, 2011). "Xbox 720 Appears in a Real Steel Trailer". IGN. Ziff Davis. Retrieved June 21, 2015. ^ Crossly, Rob (May 5, 2011). "Develop source: New Xbox console on desks at EA". Develop. NewBay Media. Archived from the original on July 15, 2013. Retrieved June 26, 2013. ^ Goldfarb, Andrew (February 28, 2012). "Report: Next Xbox Codenamed 'Durango'". IGN. Ziff Davis. Retrieved May 21, 2013. ^ Goldfarb, Andrew (July 29, 2012). "Xbox 720 Development Kit Photos Surface". IGN. Ziff Davis. Retrieved June 26, 2013. ^ Dyer, Mitch (June 16, 2012). "Xbox 720 Price, Features Revealed in Allegedly Leaked Document". IGN. Ziff Davis. Retrieved June 26, 2013. ^ Tolito, Stephan (January 25, 2012). "Sources: The Next Xbox Will Play Blu-Ray, May Not Play Used Games (And Will Introduce Kinect 2)". Kotaku. Univision Communications. Retrieved June 25, 2013. ^ Holpuch, Amanda (May 21, 2013). "Microsoft unveils Xbox One console — as it happened | Technology". The Guardian. Guardian News and Media. Retrieved June 24, 2013. ^ Wagner, Kyle (May 12, 2005). "Xbox One: Everything You Need to Know About Microsoft's New Console". Gizmodo. Univision Communications. Retrieved June 24, 2013. ^ a b c Goldfarb, Andrew (May 21, 2013). "Xbox One Announced". IGN. Ziff Davis. Retrieved May 21, 2013. ^ a b Plafke, James (June 10, 2013). "E3 2013: How the Xbox One will use SmartGlass". Geek.com. Ziff Davis. Retrieved June 11, 2013. ^ a b Xbox Leadership Team (August 14, 2013). "Xbox One Launch Markets Confirmed". Xbox Wire. Microsoft. Retrieved August 24, 2013. ^ a b Pereira, Chris (August 14, 2015). "Microsoft Downscale Xbox One 2013 Launch to 13 Markets". IGN. Ziff Davis. Retrieved June 30, 2015. ^ Conditt, Jessica (August 14, 2013). "Report: Xbox One regional delays due to Kinect localization issues". Joystiq. AOL. Retrieved August 29, 2013. ^ Skillings, Jon (March 18, 2014). "Xbox One 26 new markets". CNET. CBS Interactive. Retrieved March 23, 2014. ^ "Xbox One Coming to 26 New Markets in September". Xbox Wire. Microsoft. March 18, 2014. Retrieved March 18, 2014. ^ "Xbox One to Launch Next Generation of Gaming in China September 23". Xbox Wire. Microsoft. July 30, 2014. Retrieved July 30, 2014. ^ a b c "Xbox One: A Modern, Connected Device". Xbox Wire. 343 Industries. June 6, 2013. Retrieved June 6, 2013. ^ Grubb, Jeffrey (May 21, 2013). "Deal with it: Xbox One requires an Internet connection". VentureBeat. Retrieved June 7, 2013. ^ "How Games Licensing Works on Xbox One". Xbox Wire. 343 Industries. June 6, 2013. Retrieved June 6, 2013. ^ a b "Your Feedback Matters - Update on Xbox One". Xbox. Microsoft. June 19, 2013. Retrieved December 8, 2016. ^ Tibken, Shara (May 21, 2013). "Used games are here to stay with Xbox One but details hazy". CNET. CBS Interactive. Retrieved May 22, 2013. ^ Sliwinski, Alexander (May 22, 2013). "Xbox One will definitely be in used games market, details still blurry". Joystiq. AOL. Retrieved May 22, 2013. ^ Bramwell, Tom (June 7, 2013). "Microsoft kills game ownership and expects us to smile". Eurogamer. Gamer Network. Retrieved June 7, 2013. ^ King, Ryan (June 7, 2013). "Xbox One: It's Made For Publishers, Not For You". NowGamer. Retrieved June 7, 2013. ^ Parfitt, Ben (June 7, 2013). "Indie retailers desperate for Xbox One pre-owned answers". MCV. NewBay Media. Archived from the original on June 11, 2013. Retrieved June 7, 2013. ^ Gaston, Martin (June 7, 2013). "Preowned games on Xbox One decided by publisher". GameSpot. CBS Interactive. Retrieved December 13, 2016. ^ McShea, Tom (June 10, 2013). "Sony's Triumphant Night". GameSpot. CBS Interactive. Retrieved December 13, 2016. ^ Orland, Kyle (June 12, 2013). "Microsoft defends the Xbox One's licensing, used game policies". Ars Technica. Condé Nast. Retrieved June 16, 2013. ^ Chang, Jon M (June 20, 2013). "Xbox 180: Microsoft Backpedals on 2 Controversial Xbox One Features". ABC News. ABC. Retrieved April 3, 2016. ^ Rigney, Ryan (June 19, 2016). "Xbox 180: Microsoft Fully Reverses Xbox One's DRM Policies". Wired. Condé Nast. Retrieved April 3, 2016. ^ a b "Set up and install the Blu-ray and DVD player app on Xbox One". Xbox.com. Microsoft. Archived from the original on December 8, 2016. Retrieved January 8, 2015. ^ Totilo, Stephen (June 19, 2013). "Surprise Xbox One DRM Reversal Requires Day One Patch, Cuts Features". Kotaku. Univision Communications. Retrieved June 19, 2013. ^ Phillips, Tom (July 15, 2013). "Xbox One's Family Sharing feature may return, Microsoft says". Eurogamer. Gamer Network. Retrieved July 15, 2013. ^ Totilo, Stephen (June 19, 2013). "Xbox One DRM Reversal Cuts Features, Requires One-Time Connection". Kotaku. Univision Communications. Retrieved June 19, 2013. ^ Chalk, Andy (June 19, 2013). "Microsoft Drops Xbox One DRM Restrictions — UPDATED". The Escapist. Defy Media. Retrieved June 19, 2013. ^ Garrett, Patrick (June 21, 2013). "Xbox One's DRM u-turn: thank Sony, not the core". VG247. Retrieved June 26, 2013. ^ Brightman, James (July 1, 2013). "Xbox One: "The buck stopped with Mattrick"". GamesIndustry.biz. Gamer Network. Retrieved July 1, 2013. ^ Crecente, Brian (June 5, 2013). "Privacy concerns threaten to overshadow Microsoft's new console". Polygon. Vox Media. Retrieved June 10, 2013. ^ Sottek, T.C. (May 27, 2013). "Microsoft may award achievements for watching TV and ads by monitoring you with Kinect". The Verge. Vox Media. Retrieved June 10, 2013. ^ McWhertor, Michael (June 6, 2013). "Kinect on Xbox One will not record or upload your conversations, Microsoft says". Polygon. Vox Media. Retrieved June 10, 2013. ^ Greenwald, Will (May 22, 2013). "Hello Xbox One, Goodbye Freedom". PC Magazine. Ziff Davis. Retrieved May 23, 2013. ^ Schreier, Jason (August 12, 2013). "Kinect No Longer Mandatory For Xbox One (But Will Still Come With It) [UPDATE]". Kotaku. Univision Communications. Retrieved August 23, 2013. ^ Anthony, Sebastian (August 13, 2013). "Xbox One no longer requires Kinect, but it'll still come in the box, and you'll still pay $500". ExtremeTech. Ziff Davis. Retrieved September 5, 2013. ^ Langley, Hugh (September 12, 2013). "Microsoft throws next-gen gaming an Xbone". TechRadar. Future plc. Retrieved April 19, 2014. ^ Reed, Brad. "Microsoft's Xbox 180: Upcoming Xbox One to drop DRM restrictions, internet requirement after public backlash". Yahoo! News. BGR News. Retrieved June 22, 2013. ^ O'Mara, Matthew (May 24, 2013). "Why 'XBone' has stuck as a nickname for Microsoft's new console". Financial Post. Postmedia Network. Retrieved June 13, 2013. ^ Lewis, Helen (June 11, 2013). "With Xbox One, what's yours is theirs". The Guardian. Guardian News and Media. Retrieved June 13, 2013. ^ U.S. Department of Justice. Fourth member of hacking ring pleads guilty to hacking and intellectual property theft, fbi.gov, April 1, 2015. ^ FBI arrests trio for Microsoft Xbox hacking, The Smoking Gun, April 10, 2014. ^ Totilo, Stephen (September 30, 2014). "Hackers Charged With Stealing From Valve, Microsoft And More". Kotaku. Univision Communications. Retrieved December 3, 2016. ^ a b c d e Pino, Nick. "Xbox One S review". TechRadar. Future plc. Retrieved August 4, 2016. ^ a b Warren, Tom (June 12, 2017). "Look for these Xbox One X logos to know you're getting enhanced 4K and HDR games". The Verge. Vox Media. Retrieved June 12, 2017. ^ Warren, Tom (April 16, 2019). "Microsoft unveils disc-less Xbox One S All-Digital Edition for $249". The Verge. Retrieved April 16, 2019. ^ Leone, Matt (May 21, 2013). "Microsoft explains the design of the Xbox One". Polygon. Vox Media. Retrieved May 28, 2013. ^ Goldfarb, Andrew (May 24, 2013). "Xbox One "Intended to Sit Horizontally"". IGN. Ziff Davis. Retrieved June 27, 2015. ^ "Xbox One S vs Xbox One: What's the difference?". Pocket-lint. November 10, 2016. Retrieved August 27, 2018. ^ "Xbox One S review: Great console, bad timing". The Verge. Retrieved August 27, 2018. ^ a b Shimpi, Anand Lal (May 21, 2013). "The Xbox One: Hardware Analysis & Comparison to PlayStation 4". AnandTech. Retrieved May 22, 2013. ^ Leadbetter, Richard (October 5, 2013). "Digital Foundry: the complete Xbox One architects interview". Eurogamer. Gamer Network. Retrieved October 5, 2013. ^ Leadbetter, Richard (June 28, 2013). "Xbox One memory performance improved for production console". Eurogamer. Gamer Network. Retrieved July 4, 2013. ^ Te, Zorine (May 22, 2013). "Xbox One contains non-replaceable hard drive". GameSpot. CBS Interactive. Retrieved December 13, 2016. ^ a b c Sakr, Sharif (May 21, 2013). "Xbox One hardware and specs: 8-core CPU, 8GB RAM, 500GB hard drive and more". Engadget. AOL. Retrieved May 21, 2013. ^ Lawler, Richard (May 21, 2013). "Xbox OneGuide brings HDMI in/out, overlays for live TV". Engadget. AOL. Retrieved May 21, 2013. ^ Plafke, James (December 10, 2013). "Xbox One's 500GB Hard Drive Makes Only 362GB Available to Users". ExtremeTech. Ziff Davis. Retrieved July 18, 2015. ^ Makuch, Eddie (June 4, 2014). "Here's How External Storage Works on Xbox One". GameSpot. CBS Interactive. Retrieved May 18, 2015. ^ Kato, Matthew (May 21, 2013). "The Tech Spec Test: Xbox One Vs. PlayStation 4". Game Informer. GameStop. Retrieved May 22, 2013. ^ Totilo, Stephen (May 23, 2013). "Your Xbox One Games Can Be Suspended (Or Terminated)". Kotaku. Univision Communications. Retrieved June 21, 2013. ^ Wagner, Kyle (May 22, 2013). "Xbox One: All the Nerdy Details You Don't Know Yet". Gizmodo. Univision Communications. Retrieved June 20, 2013. ^ Hanson, Ben (May 21, 2013). "Interview With Xbox One's Chief Product Officer Marc Whitten". Game Informer. GameStop. Retrieved May 22, 2013. ^ Anthony, Sebastian (July 1, 2013). "DirectX 11.2 Will Be a Windows 8.1 and Xbox One Exclusive: Microsoft Dangle the Upgrade Carrot". ExtremeTech. Ziff Davis. Retrieved June 30, 2015. ^ Smith, Matt (November 6, 2013). "How to upgrade your PC to put it on par with the PS4 and Xbox One". Digital Trends. Retrieved December 8, 2016. ^ Anthony, Sebastian (May 23, 2013). "Xbox One: Hardware and Software Specs Detailed and Analyzed". ExtremeTech. Ziff Davis. Retrieved June 19, 2015. ^ Chapple, Craig (May 21, 2013). "Xbox One 'not targeting' highest-end graphics". Develop. NewBay Media. Archived from the original on June 9, 2013. Retrieved June 5, 2013. ^ Farokhmaneshon, Megan (May 21, 2013). "Xbox One uses HDMI output, doesn't support component connections". Polygon. Vox Media. Retrieved May 21, 2013. ^ "Xbox One now supports Dolby Atmos and DTS:X audio". Engadget. Retrieved November 27, 2017. ^ "Xbox One is getting Dolby Vision support". The Verge. Retrieved August 27, 2018. ^ a b c d e f g h Webster, Andrew (June 13, 2016). "Microsoft announces the Xbox One S, its smallest Xbox yet". The Verge. Vox Media. Retrieved June 13, 2016. ^ Yin-Poole, Wesley (June 14, 2016). "Forza Horizon 3 uses the Xbox One S high dynamic range tech". Eurogamer. Gamer Network. Retrieved June 15, 2016. ^ Hoss, Brian (July 23, 2016). "The Xbox One S Will Support HDR10, But Dolby Atmos, Direct Bitstreaming, & DTS:X Support Remain Elusive". HighDefDigest. Internet Brands. Retrieved July 29, 2016. ^ Gies, Arthur (June 13, 2016). "Games can perform better on Xbox One S". Polygon. Vox Media. Retrieved June 15, 2016. ^ Phillips, Tom (June 15, 2016). "Xbox One S won't give games a performance boost, Microsoft insists •". Eurogamer. Gamer Network. Retrieved July 20, 2016. ^ Machkovech, Sam (August 2, 2016). "Microsoft hid performance boosts for old games in Xbox One S, told no one". Ars Technica. Condé Nast. Retrieved August 2, 2016. ^ Reisinger, Don (August 14, 2013). "Xbox One knows when it's overheating, adjusts accordingly". CNET. CBS Interactive. Retrieved August 19, 2013. ^ Hsu, Dan "Shoe" (November 18, 2013). "The Xbox One controller: Projectors, smells (! ), and other stuff that didn't make it in (part 1, exclusive)". VentureBeat. Retrieved April 9, 2015. ^ a b c Phillips, Tom (June 6, 2013). "Xbox One controller can be plugged in via USB to save power". Eurogamer. Gamer Network. Retrieved January 10, 2015. ^ Hsu, Dan "Shoe" (November 19, 2013). 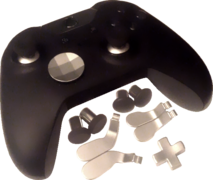 "The Xbox One controller: What's new with the analog sticks and D-pad (part 2, exclusive)". VentureBeat. Retrieved June 11, 2015. ^ Hsu, Dan "Shoe" (November 20, 2013). "The Xbox One controller: What's new with the buttons and triggers (part 3, exclusive)". VentureBeat. Retrieved June 11, 2015. ^ Goldfarb, Andrew (May 24, 2013). "Microsoft Explains Xbox One Controller's New Buttons". IGN. Ziff Davis. Retrieved May 26, 2013. ^ Lowe, Scott (May 21, 2013). "Xbox One Controller Hands-on". IGN. Ziff Davis. Retrieved May 22, 2013. ^ a b c Needleman, Sarah E. (May 13, 2014). "Microsoft Adds New 1 TB Xbox One and Keeps Lower Price on 500 GB Model". The Wall Street Journal. Dow Jones & Company. Retrieved June 11, 2015. ^ a b Nelson, Major (June 9, 2015). "New Xbox One 1TB Console Unveiled, Xbox One 500GB Console Reduced to $349". Xbox Wire. Microsoft. Retrieved June 11, 2015. ^ Welch, Chris (June 13, 2016). "Microsoft's new Xbox finally ditches the annoying power brick". The Verge. Vox Media. Retrieved June 13, 2016. ^ Sarkar, Samit (September 18, 2014). "Xbox One controller for PC coming in November, and it's strangely familiar". Polygon. Vox Media. Retrieved September 18, 2014. ^ Pereira, Chris (December 10, 2015). "You No Longer Have to Be on Windows 10 to Use the Xbox One Wireless Adapter". GameSpot. CBS Interactive. Retrieved December 10, 2015. ^ Dingman, Hayden (June 9, 2015). "The Xbox One wireless controller adapter is exclusive to Windows 10 for reasons". PC World. IDG. Retrieved June 11, 2015. ^ Machkovech, Sam (June 15, 2015). "Microsoft unveils new $150 Xbox One Elite controller—and we've held it". Ars Technica. Condé Nast. Retrieved June 17, 2015. ^ Welch, Chris (June 15, 2015). "Microsoft's Xbox One Elite Controller could be the ultimate console gamepad". The Verge. Vox Media. Retrieved June 17, 2015. ^ Robinson, Martin (June 16, 2015). "Microsoft Introduce the New Modular Xbox Elite Wireless Controller". Eurogamer. Gamer Network. Retrieved June 21, 2015. ^ Machkovech, Sam (January 23, 2017). "Clever "copilot" controller mode launches in latest Xbox guide update". Ars Technica. Retrieved January 9, 2019. ^ Stark, Chelsea (May 17, 2018). "Microsoft's new Xbox controller is designed entirely for players with disabilities". Polygon. Retrieved January 9, 2019. ^ Hussain, Tamoor (November 10, 2018). "Xbox One Keyboard And Mouse Supported By Fortnite, Feature Launches Next Week". GameSpot. Retrieved December 18, 2018. ^ Ramée, Jordan (November 20, 2018). "Xbox One Now Supports Mouse And Keyboard For Select Titles, Like Fortnite And Warframe". GameSpot. Retrieved December 18, 2018. ^ Warren, Tom (September 25, 2018). "Microsoft announces Xbox One keyboard and mouse support with Razer partnership". The Verge. Retrieved December 18, 2018. ^ a b O'Brien, Terrence (May 21, 2013). "Microsoft's new Kinect is official: larger field of view, HD camera, wake with voice". Engadget. AOL. Retrieved June 24, 2013. ^ Bamji, Cyrus S.; O'Connor, Patrick; Elkhatib, Tamer; Mehta, Swati; Thompson, Barry; Prather, Lawrence A.; Snow, Dane; Akkaya, Onur Can; Daniel, Andy; Payne, Andrew D.; Perry, Travis; Fenton, Mike; Chan, Vei-Han (January 2015). "A 0.13 μm CMOS System-on-Chip for a 512 × 424 Time-of-Flight Image Sensor With Multi-Frequency Photo-Demodulation up to 130 MHz and 2 GS/s ADC". IEEE Journal of Solid-State Circuits. 50 (1): 303–319. doi:10.1109/JSSC.2014.2364270. ^ Tach, Dave (May 21, 2013). "Kinect is always listening on Xbox One, but privacy is a 'top priority' for Microsoft". Polygon. Vox Media. Retrieved May 22, 2013. ^ Dyer, Mitch (July 1, 2013). "Xbox One Kinect Will Scan Redemption Codes". IGN. Ziff Davis. Retrieved July 2, 2013. ^ Makuch, Eddie (May 23, 2013). "Xbox One: Microsoft's Phil Spencer Talks Used Games, Always-On". GameSpot. CBS Interactive. Retrieved December 13, 2016. ^ Robinson, Andy (May 13, 2014). "Microsoft to release Xbox One without Kinect". Computer and Video Games. Future plc. Archived from the original on July 2, 2014. Retrieved May 13, 2014. ^ a b Crecente, Brian (May 9, 2014). "Microsoft: Dropping Kinect could free up extra processing power in Xbox One". Polygon. Vox Media. Retrieved May 9, 2014. ^ Maiberg, Emanuel (July 6, 2014). "Microsoft Store Lists Kinect for Windows v2 for $200, July 15 Release Date". GameSpot. CBS Interactive. Retrieved October 2, 2014. ^ a b c Makuch, Eddie (August 27, 2014). "Standalone Xbox One Kinect Launching October 7 for $150 With Dance Central". GameSpot. CBS Interactive. Retrieved December 16, 2014. ^ Yin-Poole, Wesley (October 25, 2017). "Kinect officially dead". Eurogamer. Retrieved October 25, 2017. ^ a b Stein, Scott (January 21, 2015). "Xbox One and Windows 10: New best friends". CNET. CBS Interactive. Retrieved March 24, 2015. ^ a b c d e f Pino, Nick (August 31, 2016). "The Xbox One is getting better with every firmware update". TechRadar. Future plc. Retrieved December 4, 2016. ^ Crecente, Brian (May 22, 2013). "Xbox One architect: Operating system is the Xbox One's game changer". Polygon. Vox Media. Retrieved December 9, 2014. ^ Sakr, Sharif (May 21, 2013). "Xbox One runs three operating systems, including cut-down Windows for apps". Engadget. AOL. Retrieved May 21, 2013. ^ Chacos, Brad (April 2, 2014). "Rejoice! The Start menu is coming back to Windows". PC World. IDG. Retrieved April 2, 2014. ^ Chacos, Brad (April 2, 2014). "Microsoft's universal Windows apps run on tablets, phones, Xbox, and PCs". PC World. IDG. Retrieved April 5, 2014. ^ a b c Orland, Kyle (September 20, 2013). "Xbox One interface a clean slate inspired by Windows 8". Ars Technica. Condé Nast. Retrieved December 23, 2014. ^ a b "The Xbox One is getting a major update today, including a faster dashboard". The Verge. Retrieved October 29, 2017. ^ Makuch, Eddie (October 18, 2017). "Big Xbox One Update Out Now, Here's What It Adds". GameSpot. Retrieved October 29, 2017. ^ Veloria, Lorenzo (November 3, 2015). "Everything that's changed in the new Xbox One user interface". GamesRadar. Future plc. Retrieved November 11, 2015. ^ Warren, Tom (May 21, 2013). "Microsoft's new Xbox will include improved Siri-like speech recognition". The Verge. Vox Media. Retrieved May 21, 2013. ^ Warren, Tom (October 2, 2015). "Cortana won't be available on the Xbox One until next year". The Verge. Vox Media. Retrieved October 3, 2015. ^ a b Warren, Tom (May 21, 2013). "Xbox One: a next-gen console with a focus on interactive TV and apps". The Verge. Vox Media. Retrieved May 25, 2013. ^ a b Makuch, Eddie (November 10, 2015). "New Xbox One Update Removes Kinect Gesture Support for Dashboard Navigation". GameSpot. CBS Interactive. Retrieved November 11, 2015. ^ Pereira, Chris (September 18, 2015). "Check Out Xbox One's New, Totally Revamped Interface in Action". GameSpot. CBS Interactive. Retrieved September 18, 2015. ^ Warren, Tom (August 4, 2015). "Windows 10 preview for Xbox One set to arrive in September for testers". The Verge. Vox Media. Retrieved August 5, 2015. ^ "Xbox One Creators Update guide: Here's where everything went". PCWorld. Retrieved August 28, 2018. ^ "Microsoft's Xbox One snap mode is being removed with the new dashboard". The Verge. Vox Media. Retrieved May 8, 2017. ^ Mitchell, Richard (August 29, 2014). "Xbox One update adds Smartglass features, USB media playback". Engadget. AOL. Retrieved January 8, 2015. ^ Trenholm, Richard (August 6, 2014). "New USB tuner unlocks clever Xbox One TV features for UK gamers". CNET. CBS Interactive. Retrieved April 21, 2015. ^ Lowe, Scott (May 21, 2013). "Next Xbox Will Reportedly Integrate Broadcast TV Feeds". IGN. Ziff Davis. Retrieved May 21, 2013. ^ Lawler, Richard (May 21, 2013). "Xbox One guide brings HDMI in/out, overlays for live TV". Engadget. AOL. Retrieved May 25, 2013. ^ Makuch, Eddie (May 21, 2013). "Xbox One adds Smart Match, Game DVR". GameSpot. CBS Interactive. Retrieved December 13, 2016. ^ Rigg, Jamie (October 21, 2014). "Microsoft launches the Xbox One Digital TV Tuner in Europe". Engadget. AOL. Retrieved April 21, 2015. ^ Warren, Tom (June 8, 2016). "Microsoft isn't adding a TV DVR feature to the Xbox One anymore". The Verge. Vox Media. Retrieved July 20, 2016. ^ Yin, Wesley (June 19, 2013). "Microsoft makes the case for Xbox One's 300,000 server cloud, but what do developers think?". Eurogamer. Gamer Network. Retrieved June 24, 2013. ^ Steele, Billy (May 21, 2013). "Microsoft updates Xbox Live to outfit Xbox One with 300,000 servers, game DVR and more". Engadget. AOL. Archived from the original on June 8, 2013. Retrieved June 24, 2013. ^ Nichols, Scott (May 21, 2013). "Xbox One to expand friend lists to 1,000 friends". Digital Spy. Hearst Magazines UK. Retrieved June 24, 2013. ^ Davis, Justin (May 21, 2013). "Xbox One to Become More Powerful Over Time via Cloud Computing". IGN. Ziff Davis. Retrieved June 15, 2013. ^ a b Cangeloso, Sal (June 11, 2013). "Xbox One vs. PS4: Sony pulls ahead at E3". Geek.com. Ziff Davis. Retrieved June 15, 2013. ^ "Xbox One's holiday update arrives today with LFG, Clubs, and more". The Verge. Retrieved May 8, 2017. ^ Butts, Steve (July 20, 2013). "Comic-Con: The Future of Xbox". IGN. Ziff Davis. Retrieved December 8, 2016. ^ "The Xbox One gets Microsoft's Beam streaming and a faster interface today". The Verge. Retrieved May 26, 2017. ^ "Xbox at E3 2013: everything you need to know". The Verge. Vox Media. June 10, 2013. Retrieved June 11, 2013. ^ Grant, Christopher (August 9, 2013). "Xbox One allows households to share Live Gold status on one console with Home Gold". Polygon. Vox Media. Retrieved December 9, 2014. ^ Plafke, James (May 13, 2014). "Desperate Microsoft removes Xbox Live Gold paywall for Netflix, Hulu, other web services". ExtremeTech. Ziff Davis. Retrieved May 13, 2014. ^ Phillips, Tom (May 13, 2014). "Microsoft to remove Xbox Live Gold paywall for streaming apps". Eurogamer. Gamer Network. Retrieved May 13, 2014. ^ a b Skrebels, Joe (June 17, 2015). "Xbox One's backwards compatibility works because it's tricking your 360 games". GamesRadar. Future plc. Retrieved June 20, 2015. ^ a b Grant, Christopher (August 4, 2015). "All future Xbox 360 Games with Gold freebies will be backwards compatible on Xbox One". Polygon. Vox Media. Retrieved August 5, 2015. ^ Sinha, Robin (August 18, 2014). "Xbox One 'August' Update Roll-Out Begins; Brings New Activity Feed and More". NDTV. Retrieved January 8, 2015. ^ Matulef, Jeffrey (April 22, 2015). "Xbox One update will let you turn on the console with your phone". Eurogamer. Gamer Network. Retrieved June 15, 2015. ^ Summers, Nick (August 12, 2014). "Xbox One to Get TV Streaming for SmartGlass Apps". The Next Web. Retrieved November 10, 2015. ^ Sarkar, Samit (January 21, 2015). "Windows 10 will let you stream Xbox One games to any Windows 10 PC or tablet". Polygon. Vox Media. Retrieved January 21, 2015. ^ Warren, Tom (June 15, 2015). "Xbox One game streaming to Windows 10 PCs is available now". The Verge. Vox Media. Retrieved June 15, 2015. ^ Statt, Nick (June 15, 2015). "Oculus shows off final Rift virtual reality headset, partners with Microsoft's Xbox". CNET. CBS Interactive. Retrieved June 15, 2015. ^ Osborne, Joe (June 15, 2015). "Xbox One will get to stream games straight to Oculus Rift through Windows 10". TechRadar. Future plc. Retrieved June 15, 2015. ^ Warren, Tom (June 15, 2015). "Oculus Rift will ship with an Xbox One controller thanks to Microsoft partnership". The Verge. Vox Media. Retrieved June 15, 2015. ^ Tassi, Paul (November 7, 2014). "PS4 And Xbox One Need A Serious Digital Downloading Overhaul". Forbes. Retrieved January 18, 2015. ^ a b c Crecente, Brian (June 19, 2013). "Xbox One loses some disc-free play, family game-sharing with revised policies". Polygon. Vox Media. Retrieved June 19, 2013. ^ Machkovech, Sam (June 15, 2015). "Xbox Game Preview brings early access to Xbox One, adds free demo options". Ars Technica. Retrieved December 13, 2016. ^ a b Gies, Arthur (June 13, 2017). "Microsoft introduces branding for Xbox One X improvements". Polygon. Vox Media. Retrieved June 14, 2017. ^ Tom Warren (February 28, 2017). "Microsoft's new Xbox Game Pass subscription grants access to more than 100 games". The Verge. Retrieved February 28, 2017. ^ Romain Dillet (February 28, 2017). "The Xbox Game Pass is a $9.99 Spotify-like game subscription". TechCrunch. Retrieved March 1, 2017. ^ Sherr, Ian. "Microsoft combines Xbox Live, Xbox Game Pass in new 'ultimate' service". CNET. Retrieved April 16, 2019. ^ a b Purchese, Robert (June 17, 2013). "You can plug an Xbox 360 into the Xbox One, says Major Nelson". Eurogamer. Gamer Network. Retrieved September 28, 2013. ^ Hollister, Sean (May 21, 2013). "Xbox One will not be backwards compatible with Xbox 360 games". The Verge. Vox Media. Retrieved May 21, 2013. ^ Audrey, Drake (May 21, 2013). "Xbox One not backwards compatible". IGN. Ziff Davis. Retrieved June 5, 2013. ^ a b c d e f g h i j k l McCafferty, Ryan (October 23, 2017). "The Untold Story of Xbox One Backwards Compatibility". IGN. Retrieved October 23, 2017. ^ Makuch, Eddie (September 3, 2013). "Microsoft Talks Digital-Only Future, Kinect, and Why Xbox One is Worth $100 More Than PlayStation 4". GameSpot. CBS Interactive. Retrieved December 13, 2016. ^ Karmali, Luke (November 8, 2013). "Xbox One Backwards Compatibility Through Cloud 'Problematic'". IGN. Ziff Davis. Retrieved December 3, 2016. ^ a b Brunner, Grant (November 8, 2013). "Microsoft confirms that PS4, Wii U will work with Xbox One HDMI passthrough". ExtremeTech. Ziff Davis. Retrieved March 3, 2015. ^ Hicks, Jon. "The Xbox One 33 things you need to know". Official Xbox Magazine. Future plc. Archived from the original on September 13, 2013. Retrieved June 5, 2013. ^ Dornbush, Jonathon (June 15, 2015). "Play your old Xbox 360 games on Xbox One starting this holiday". Entertainment Weekly. Time Inc. Retrieved June 19, 2015. ^ Kollar, Philip (August 3, 2015). "Rare Replay review: in times past". Polygon. Vox Media. Retrieved August 5, 2015. ^ Warren, Tom (June 15, 2015). "Microsoft is bringing Xbox 360 games to the Xbox One". The Verge. Vox Media. Retrieved June 15, 2015. ^ Machkovech, Sam (June 15, 2015). "Xbox 360 backward compatibility coming to Xbox One". Ars Technica. Condé Nast. Retrieved June 15, 2015. ^ Warren, Tom (June 15, 2015). "Microsoft built an Xbox 360 emulator to make games run on the Xbox One". The Verge. Vox Media. Retrieved June 15, 2015. ^ Makuch, Eddie (August 19, 2015). "Xbox One Backwards Compatibility Could One Day Work With Original Xbox Games". GameSpot. CBS Interactive. Retrieved July 20, 2016. ^ Kohler, Chris (June 11, 2017). "Xbox One Will Get Compatibility With Original Xbox Games". Kotaku. Retrieved June 11, 2017. ^ Grant, Christopher (October 23, 2017). "Original Xbox compatibility, and 13 games, arriving on Xbox One tomorrow". Polygon. Retrieved October 23, 2017. ^ Tyrrel, Brandin (April 10, 2018). "Morrowind, Kotor 2, Jade Empire Headline New Wave Of Original Xbox Backwards Compatible Games". IGN. Retrieved April 10, 2018. ^ Bertz, Matt (May 22, 2013). "Game Informer Editors React To Xbox One News". GameInformer. GameStop. Retrieved June 11, 2013. ^ Walton, Mark (June 12, 2013). "The Uninspired Lineup of Xbox One". GameSpot. CBS Interactive. Retrieved December 13, 2016. ^ McShea, Tom (June 12, 2013). "Xbox One: New Console, Old Games". GameSpot. CBS Interactive. Retrieved December 13, 2016. ^ Mohammed, Rafi (June 21, 2013). "Did Microsoft Overshoot on Xbox One Pricing?". Bloomberg. Retrieved June 23, 2013. ^ Makuch, Eddie (June 24, 2013). "Xbox One pricing "too high" says business author". GameSpot. CBS Interactive. Retrieved December 13, 2016. ^ "The Xbox One Review". Polygon. Vox Media. Retrieved December 16, 2014. ^ Gilbert, Ben (November 20, 2013). "Xbox One review: a fast and powerful work in progress". Engadget. AOL. Retrieved December 16, 2014. ^ Bakalar, Jeff (November 16, 2015). "Slow and steady, the Xbox One gradually improves". CNET. CBS Interactive. Retrieved December 16, 2014. ^ Yee, Alaina (November 26, 2014). "Xbox One with Kinect Review". IGN. Ziff Davis. Retrieved June 23, 2015. ^ Bohn, Dieter (August 2, 2016). "Xbox One S review". The Verge. Vox Media. Retrieved December 31, 2016. ^ Welch, Chris (September 7, 2016). "Sony's new PlayStation 4 Pro can't play 4K Blu-rays". The Verge. Vox Media. Retrieved December 3, 2016. ^ Goldfarb, Andrew (January 9, 2017). "Microsoft Confirms Scalebound is Cancelled". IGN. Retrieved August 5, 2018. ^ "The Xbox One is struggling because video game exclusives still matter". The Verge. Retrieved August 5, 2018. ^ "Xbox's lack of compelling games won't be fixed next year". Engadget. Retrieved August 5, 2018. ^ "The Xbox One has a serious exclusive games problem". Polygon. Retrieved August 5, 2018. ^ "Microsoft announces big, multistudio push to create more Xbox exclusives". The Verge. Retrieved August 5, 2018. ^ Warren, Tom (November 10, 2018). "Microsoft's Xbox exclusives push continues with new studio acquisitions". The Verge. Retrieved December 18, 2018. ^ "You won't need an Xbox to play Microsoft's next generation of games". CNET. March 1, 2016. Retrieved August 5, 2018. ^ Crecente, Brian (July 1, 2016). "Xbox Play Anywhere launches Sept. 13". Polygon. Retrieved September 28, 2016. ^ Newhouse, Alex (June 13, 2017). "E3 2017: Xbox Boss Clarifies What "Console Launch Exclusive" Means". GameSpot. Retrieved August 5, 2018. ^ Newhouse, Alex (July 28, 2015). "Xbox One's Launch Parity Clause Is Pretty Much Over, Exec Says". GameSpot. Retrieved August 5, 2018. ^ Pereira, Chris (October 10, 2014). "Xbox One's Parity Clause Meant to Make Owners Feel "First Class"". GameSpot. Retrieved August 5, 2018. ^ a b Humphries, Matthew (October 26, 2015). "Microsoft decides not to share Xbox One sales figures anymore". Geek.com. Ziff Davis. Retrieved December 3, 2016. ^ Statt, Nick (November 22, 2013). "What console war? Microsoft sells 1M Xbox Ones in first 24 hours". CNET. CBS Interactive. Retrieved November 23, 2013. ^ "Xbox One dominated Black Friday sales, according to analyst". Computer and Video Games. Future plc. December 2, 2013. Archived from the original on March 31, 2014. Retrieved December 2, 2013. ^ Bass, Dina (December 11, 2013). "Microsoft's Xbox One Sales Hit 2 Million". Bloomberg. Retrieved December 6, 2016. ^ "Xbox One is Fastest Selling Console in the US; November NPD Group Figures Revealed". Xbox Wire. Microsoft. December 12, 2013. Retrieved December 6, 2016. ^ Haywald, Justin (December 12, 2013). "NPD: Xbox One is the "fastest-selling" console in November and Call of Duty leads software". GameSpot. CBS Interactive. Retrieved December 14, 2013. ^ Tassi, Paul (January 6, 2014). "Microsoft Reveals 3 Million Xbox One Sales In 2013". Forbes. Retrieved February 19, 2014. ^ Warren, Tom (January 23, 2014). "Microsoft's Q2: record $24.52 billion revenue and 3.9 million Xbox One sales". The Verge. Vox Media. Retrieved February 19, 2014. ^ Mehdi, Yusuf (November 12, 2014). "Xbox One Sales on the Rise". Xbox Wire. Microsoft. Retrieved November 12, 2014. ^ Matulef, Jeffrey (November 12, 2014). "Xbox One Has Sold In Almost 10m Units to Retailers". Eurogamer. Gamer Network. Retrieved June 19, 2015. ^ Juba, Joe (December 11, 2014). "November NPD: Xbox One Overtakes PS4 This Month". Game Informer. GameStop. Retrieved December 23, 2014. ^ Sinclair, Brendan (January 11, 2016). "Xbox only hurting itself by refusing to share sales numbers". GamesIndustry.biz. Gamer Network. Retrieved December 8, 2016. ^ Romano, Sal (September 10, 2014). "Xbox One sells 23,000 during first week in Japan". Gematsu. Retrieved December 6, 2016. ^ "【速報】Xbox Oneの初週販売台数は23562台　ソフトの1位は『タイタンフォール』に". Famitsu. Enterbrain, Inc., Tokuma. September 10, 2014. Retrieved December 6, 2016. ^ Phillips, Tom (June 22, 2015). "Xbox One Weekly Japan Sales Hit New All-Time Low". Eurogamer. Gamer Network. ^ Walton, Marky (January 29, 2016). "EA lets slip lifetime Xbox One and PS4 consoles sales". Ars Technica. Condé Nast. Retrieved February 5, 2016. ^ Graham, Luke (April 22, 2016). "Have we just found out how bad Xbox sales are?". CNBC. NBCUniversal. Retrieved December 3, 2016. ^ GameCentral (January 11, 2016). "Xbox One worldwide sales at 18 million, PS4 at 36 million". Metro. DMG Media. Retrieved December 3, 2016. ^ "E3: Xbox One chief teases Halo Infinite video game". BBC. June 10, 2018. Retrieved August 13, 2018. ^ a b c Fingas, Jon (June 10, 2013). "Early Xbox One buyers to get Day One Edition consoles". Engadget. AOL. Retrieved December 1, 2014. ^ Sarkar, Samit (May 13, 2014). "Kinect-free Xbox One coming June 9 for $399". Polygon. Vox Media. Retrieved December 1, 2014. ^ a b c d Moscaritolo, Angela (May 31, 2016). "Microsoft Drops Xbox One Price to $299". PC Magazine. Ziff Davis. Retrieved June 13, 2016. ^ Warren, Tom (May 31, 2016). "Xbox One price drops to $299 ahead of 'slim' console rumor for E3". The Verge. Vox Media. Retrieved June 13, 2016. ^ a b Warren, Tom (June 14, 2016). "Xbox One price drops again to $279". The Verge. Vox Media. Retrieved June 18, 2016. ^ a b Makuch, Eddie (September 1, 2015). "This New Xbox One Will Boot Up 20 Percent Faster". GameSpot. CBS Interactive. Retrieved September 1, 2015. ^ Corriea, Alexa Ray (November 21, 2013). "Watch an unboxing of a Microsoft employee's white Xbox One". Polygon. Vox Media. Retrieved December 1, 2014. ^ Humphries, Matthew (March 7, 2014). "Respawn employees gifted limited edition Titanfall Xbox One". Geek.com. Ziff Davis. Retrieved December 1, 2014. ^ Webster, Andrew (March 6, 2014). "Microsoft launching Xbox One bundle with 'Forza 5' next week". The Verge. Vox Media. Retrieved January 10, 2015. ^ Karmali, Luke (August 5, 2014). "White Xbox One Heading to Retail With Sunset Overdrive". IGN. Ziff Davis. Retrieved August 8, 2014. ^ Nunneley, Stephany (November 4, 2014). "That snazzy Limited Edition Call of Duty: Advanced Warfare Xbox One Bundle has released". VG247. Retrieved December 1, 2014. ^ Page, Dennis (September 11, 2014). "Introducing the Xbox One Call of Duty: Advanced Warfare Bundle". IGN. Ziff Davis. Retrieved December 1, 2014. ^ Whitney, Lance (October 15, 2014). "Xbox One bundles to offer free Assassin's Creed games". CNET. CBS Interactive. Retrieved December 1, 2014. ^ Reisinger, Don (March 9, 2015). "Xbox One bundle includes Master Chief Collection". CNET. CBS Interactive. Retrieved May 18, 2014. ^ Sarkar, Samit (June 23, 2015). "Forza 6 bundled with limited-edition blue Xbox One for Forza's 10th anniversary". Polygon. Vox Media. Retrieved October 17, 2015. ^ Kain, Erik (October 21, 2015). "'Halo 5' Xbox One Bundles Are Arriving A Week Before The Game Launches". Forbes. Retrieved October 22, 2015. ^ "Xbox One Limited Edition Halo 5 Guardians Bundle". Xbox.com. Microsoft. Archived from the original on December 8, 2016. Retrieved October 22, 2015. ^ "Microsoft's All Access subscription really is a good deal if you want an Xbox". Polygon. Retrieved August 27, 2018. ^ Fogel, Stefanie (August 27, 2018). "Microsoft Launching Xbox All-Access Financing Program". Variety. Retrieved August 27, 2018. ^ Orland, Kyle (July 26, 2016). "Slimmed down 2TB Xbox One S hits stores August 2 for $399". Ars Technica. Condé Nast. Retrieved July 26, 2016. ^ Whitney, Lance. "Xbox One S 500GB, 1TB bundles to launch on August 23". CNET. CBS Interactive. Retrieved August 4, 2016. ^ Sirani, Jordan (July 14, 2016). "Gears of War 4-Themed Xbox One S Officially Revealed". IGN. Retrieved November 14, 2017. ^ a b "Microsoft cuts Xbox One S price by $50 ahead of Project Scorpio unveiling". The Verge. Retrieved June 11, 2017. ^ "Limited-Edition Minecraft Xbox One S Available to Pre-Order". PC Magazine. Retrieved November 14, 2017. ^ "Fortnite Xbox One S bundle features some console exclusives". Polygon. Retrieved September 26, 2018. ^ "Announcing the Minecraft Creators Bundle - Xbox Wire". news.xbox.com. Retrieved October 10, 2018. ^ "Minecraft Creators Xbox One S bundle coming 'soon' for $299". Windows Central. Retrieved October 10, 2018. ^ Sherr, Ian. "Microsoft's Xbox One S All-Digital Edition and Xbox Game Pass Ultimate: Everything we know". CNET. Retrieved April 16, 2019. ^ a b c d e Warren, Tom (June 11, 2017). "Xbox One X is Microsoft's next game console, arriving on November 7th for $499". The Verge. Vox Media. Retrieved June 12, 2017. ^ Warren, Tom (August 20, 2017). "Microsoft's Project Scorpio returns as a special Xbox One X for preorders". The Verge. Vox Media. Retrieved November 11, 2017. ^ Sarkar, Samit (November 8, 2017). "What do the numbers on the Xbox One X Project Scorpio Edition box mean?". Polygon. Vox Media. Retrieved November 11, 2017. ^ Lawler, Richard (June 9, 2017). "Xbox exec reveals Scorpio has 9GB of RAM available for games". Engadget. AOL. Retrieved June 12, 2017. ^ a b Leadbetter, Richard (April 6, 2017). "Inside the next Xbox: Project Scorpio tech revealed". Eurogamer. Gamer Network. Retrieved April 6, 2017. ^ Walton, Mark (June 12, 2017). "Xbox One X: Everything you need to know". Ars Technica. Condé Nast. Retrieved August 4, 2017. ^ Rejhon, Mark (April 21, 2018). "XBox Consoles Now Support 120Hz". Blur Busters. Retrieved April 21, 2018. ^ a b c Webster, Andrew (June 13, 2016). "Project Scorpio is a 4K-capable, VR-ready Xbox One launching next fall". The Verge. Vox Media. Retrieved June 13, 2016. ^ Orland, Kyle (October 28, 2015). "How dynamic resolution scaling keeps Halo 5 running so smoothly". Ars Technica. Condé Nast. Retrieved June 13, 2016. ^ Paul, Ian (March 2, 2017). "Windows 'Mixed Reality' VR headsets will hit the Xbox One and Project Scorpio next year". PCWorld. IDG. Retrieved April 26, 2018. ^ Crecente, Brian (June 6, 2017). "Don't expect Xbox VR to be at E3 this year, or in stores this holiday". Polygon. Vox Media. Retrieved June 11, 2017. ^ Matulef, Jeffrey (June 14, 2016). "Project Scorpio won't have any exclusives". Eurogamer. Gamer Network. Retrieved June 14, 2016. ^ Makuch, Eddie (June 13, 2016). "Some Games Could Be Exclusive to New Xbox Scorpio System". GameSpot. CBS Interactive. Retrieved June 13, 2016. ^ Warren, Tom (June 13, 2017). "Xbox's Phil Spencer: PS4 Pro is an Xbox One S competitor, not a true 4K console". The Verge. Vox Media. Retrieved June 14, 2017. ^ Byford, Sam (June 16, 2016). "First Click: Are Sony and Microsoft's new consoles PC gone mad?". The Verge. Vox Media. Retrieved June 18, 2016. ^ Makuch, Eddie (October 10, 2016). "Xbox Scorpio vs. PS4 Pro -- Microsoft Discusses Its Big Power Advantage". GameSpot. CBS Interactive. Retrieved October 21, 2016. ^ Souppouris, Aaron (June 14, 2016). "It's never been harder to buy an Xbox One". Engadget. AOL. Retrieved June 14, 2016. ^ Parfitt, Ben (June 15, 2016). "4K won't be mandatory for Xbox Scorpio games". MCV. NewBay Media. Retrieved June 15, 2016. ^ Pereira, Chris (August 9, 2016). "Microsoft Confirms 2 TB Xbox One S Launch Model Is a Limited-Time Version". Gamespot. Retrieved October 19, 2018. ^ "Microsoft Project Scorpio Dev Kit detailed". Fudzilla.com. April 14, 2017. Retrieved December 22, 2017. ^ Cutress, Ian (August 21, 2017). "Hot Chips: Microsoft Xbox One X Scoprio Engine Live Blog". Anandtech. Retrieved August 21, 2017. ^ Developers, The. "Xbox One Dimensions and Kinect Cable Length Revealed « GamingBolt.com: Video Game News, Reviews, Previews and Blog". Gamingbolt.com. Retrieved December 22, 2017. ^ Sam Machkovech - August 2, 2016 1:00 pm UTC (August 2, 2016). "Xbox One S: The smaller, handsomer, 4K-ier system we've been looking for". Ars Technica. Retrieved December 22, 2017. ^ "Xbox One X Specs". Xbox One X. Microsoft.com. Retrieved November 15, 2009. Wikimedia Commons has media related to Xbox One.